'Wales Gets a Taste of the Avant-Garde', reported The Times in 1957 for a review of an exhibition at the National Museum of Wales by the newly-formed 56 Group of professional artists. It was founded the previous year by Eric Malthouse, David Tinker and Michael Edmonds. Tinker later wrote: 'The need was felt to voice a clear radical point of view, radical in the sense of forward-looking… Only a minimum of space was given to an artist who was aware of the rising tide of abstract art in New York and Paris. Not that the group was founded as an 'abstract' group. The net was widely spread.' Public reaction was mixed, however, and works were even vandalised in early exhibitions. 56 Group Wales, as it later became, was both celebrated and criticised and yet, until now, its history has not been explored in detail. 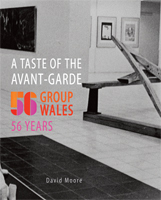 Crooked Window have researched, written, designed and published A Taste of the Avant-Garde: 56 Group Wales, 56 Years, a fully-illustrated concise account of the Group's development. 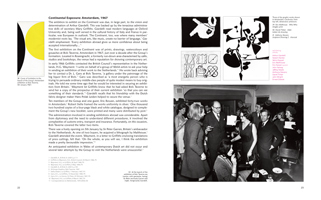 Drawing extensively from the Group's archive, the book focuses upon the contribution of individuals to the changing exhibiting character of the Group. Many members, particularly in its early decades, taught in art schools. The intensity of its exhibiting, and the administration driving it, reveal the Group's ambitions. A third of exhibition showings have been outside Wales in England, Scotland, Northern Ireland, the Republic of Ireland and, perhaps most strikingly, on the Continent. One of the nine artists who joined the three founders in 1956 was Arthur Giardelli, who became its chair in 1961 and was its driving force for nearly four decades. Mary Griffiths, the Group's loyal secretary for twenty-six years, as well as David Tinker, its long-term vice-chair and treasurer, also emerge as a key figures. The Group evolved from a radical group founded partly as a reaction against plans for a South Wales Academy, into one embraced by the art establishment and considered at one time, controversially, to be the official face of modern art in Wales. Whilst its nature has changed, it has generated periods of intense activity. 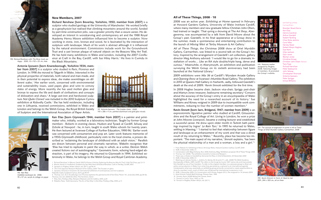 Despite varying fortunes, it continues to evolve, encompassing today a range of styles and techniques by notable artists including Dilys Jackson, the current chair. 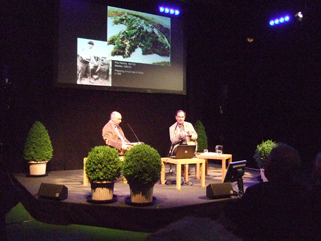 In 2012 the Group marked its fifty-sixth anniversary. 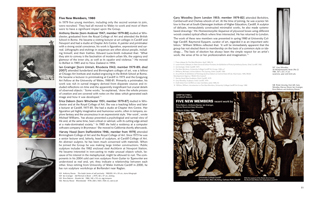 It sometimes played with the number '56' in exhibition publicity and, for this reason, 2012 seemed an appropriate year in which to explore its achievements. After fifty-six years, the involvement of eighty-eight full members as well as associate members, and with around two hundred and twenty-five exhibition showings, it has been re-energised and has recruited fresh members. Press here to listen to the interview. 56 Group members - past and current: Artstation (Anne Hayes & Glenn Davidson), Alain Ayers, Mervyn Baldwin, Trevor Bates, Paul Beauchamp, William Brown, Peter Bunting, Brendan Stuart Burns, Laurence Burt, Barrie Cook, Josephine Coy, Jack Crabtree, Erica Daborn, Bryony Dalefield, Hubert Dalwood, Anthony Davies, Geoffrey Davies, Paul Davies, Michael Edmonds, Ken Elias, Peter Ellis, George Fairley, Dennis Gardiner, Arthur Giardelli, Tom Gilhespy, David Gould, Ian Grainger, Robert Harding, Adrian Heath, Clive Hicks-Jenkins, Carol Hiles, Harvey Hood, Tom Hudson, Robert Alwyn Hughes, Sue Hunt, Robert Hunter, Dilys Jackson, Maggie James, Justine Johnson, Glyn Jones, Martyn Jones, Mary Lloyd Jones, Christine Kinsey, Heinz Koppel, Peter Lewis, Alison Lochhead, Kieran Lyons, Bryan Macdonald, Eric Malthouse, John Mitchell, Philip Nicol, Cherry Pickles, Tom Piper, Richard Powell, Peter Prendergast, Michael Punt, Richard Renshaw, Shani Rhys James, Keith Richardson-Jones, Will Roberts, Eric Rowan, David Saunders, Peter Seabourne, Helen Sear, John Selway, Terry Setch, David Shepherd, Christopher Shurrock, Kevin Sinnott, Derek Southall, Antonia Spowers, Peter Spriggs, Jeffrey Steele, Anthony Stevens, David Tinker, Norman Toynton, Michael Tyzack, Andrew Walton, Stephen West, William Wilkins, Emrys Williams, Michael Williams, Pete Williams, Sue Williams, Alan Wood, Gary Woodley, John Wright, Ernest Zobole.